Rabbitbrush, Ericameria nauseosa. The flowers make an excellent yellow dye. 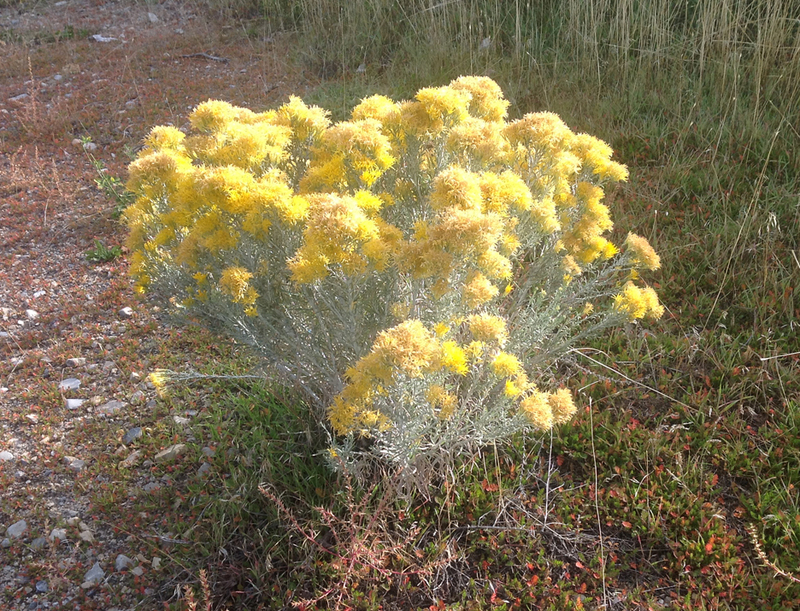 Last September, in a conversation with our biology teacher, I learned that common rabbit brush makes an excellent yellow dye for natural fabrics. It was used by Native Americans and early pioneers to dye cotton, linen, and wool. I grew up thinking of rabbit brush as a useless scrub brush that grew in unused corners on our farm where the soil had high alkali or clay or low drainage. It is often seen along road cuts and other areas where the soil has been removed or disturbed, and is one of the first plants to colonize bare soil. 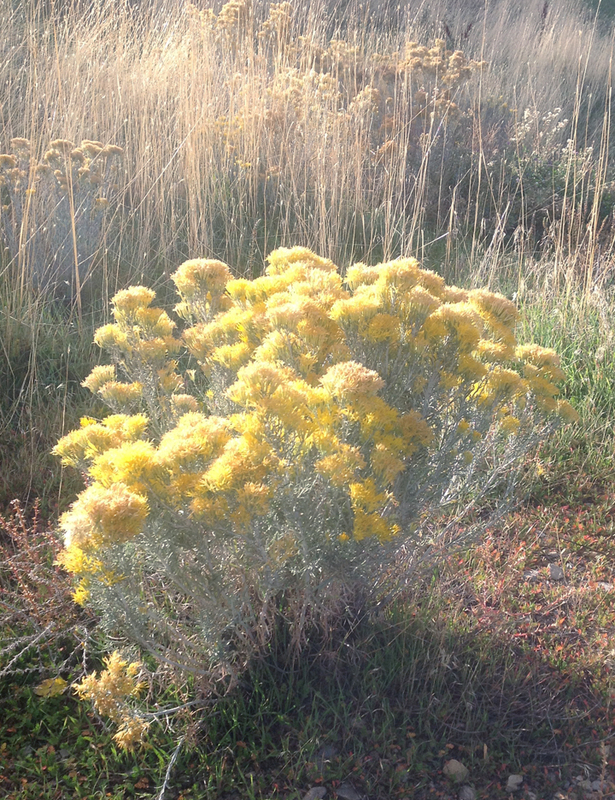 Rabbitbrush grows in poor soils and is one of the first plants to colonize disturbed areas. Intrigued by our conversation, I did some research. Its Latin name is Ericameria nauseosa for good reason: up close, the blossoms smell rather nauseating. In the early fall, it blooms with tight bundles of bright yellow flowers that can be steeped in boiling water and used for dye. I also found that it contains around 6% latex rubber in its stems and leaves to protect it from dehydrating. If a commercial method could be devised to extract the latex economically, it would be a valuable plant to grow and harvest. I had no idea. 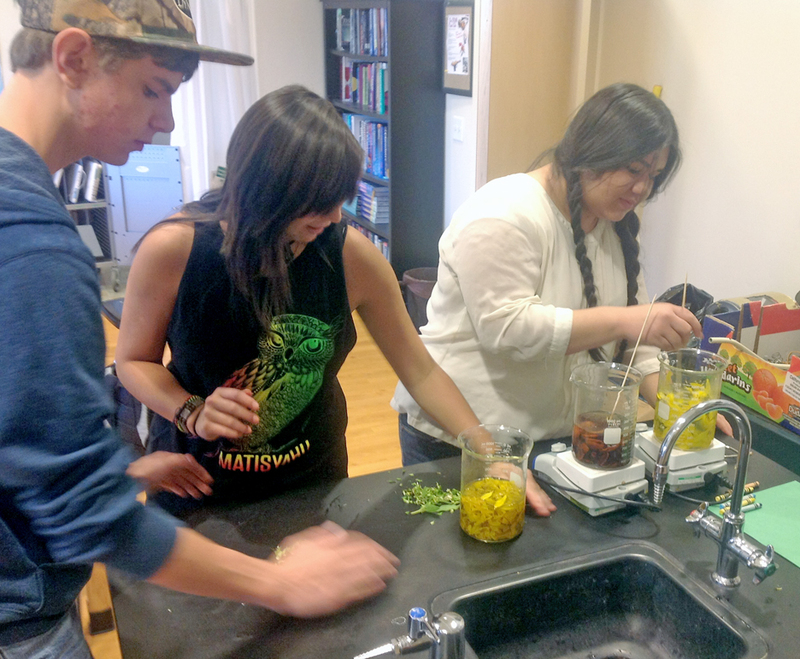 Students prepare a dye bath of sunflower petals. I decided to try rabbit brush dye in my chemistry class. My course schedule for chemistry is already overflowing with more activities and labs than I can accommodate in our limited classroom time. To add a new activity would mean giving something else up. So adding a fabric dyeing lab would only be possible if I used the activity to fulfill more than one objective. I decided it would make a great inquiry lab to introduce the scientific method and meet Utah’s Intended Learning Outcome objectives. These ILOs include teaching the history and nature of science and the scientific method across all science courses. Cloth soaking in a boiling dye bath made of rabbitbrush blossoms. I already had a number of large pieces of undyed fabric, including cotton, linen, silk, and polyester. I scrounged or ordered other types of dyestuffs, including walnut shells and cochineal. I cut the fabric into small swatches and purchased washing soda (sodium carbonate), cream of tartar, and other possible mordants. I also brought in a number of large pots from home. Dye bath made from walnut shells. The original bath was the dark brown color seen with the shells, but it was accidentally thrown out. The second attempt was lighter. On the first day of the activity, I introduced the process of science and the idea of variables and how to create an experimental design to control them. We then took a short field trip to a road embankment about ¼ mile from Walden School where a good stand of rabbit brush was growing. We collected several bags full of yellow blossoms. 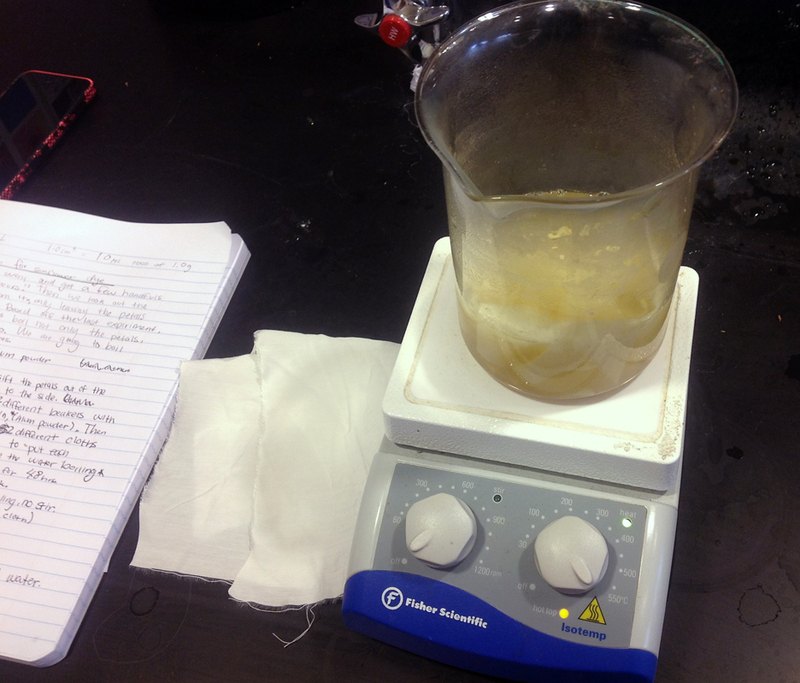 The students then divided into lab teams and designed their own experiments. 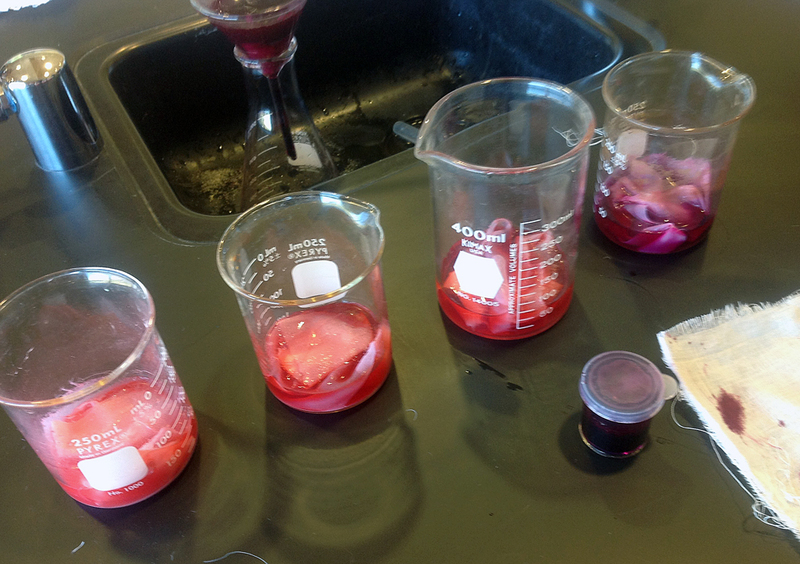 Samples of cochineal dye solutions. Cochineal is a sessile insect that lives on prickly pear cactus in Mexico and South America. It is collected, dried, and crushed to make carmine dye. We boiled the rabbit brush blossoms, some black-eyed susan petals we collected along the way (commonly called sunflowers in Utah), and walnut shells in water. The cochineal shells were ground up in a mortar and pestle, releasing a deep burgundy liquid (carminic acid). 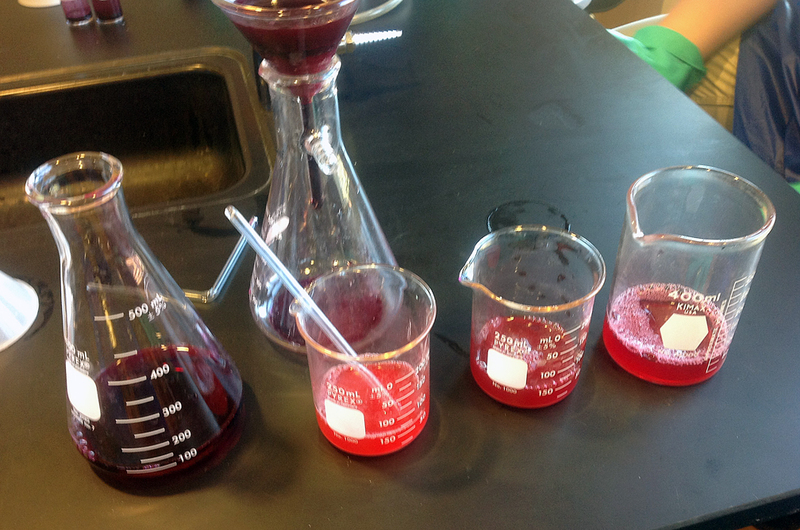 The group that tested cochineal added varying amounts of tartaric acid to stabilize the color and create a brighter red. Each group tested both synthetic and natural fibers. Some groups tested mordants, which set the color by opening up the fabric fibers. Some groups tested different times in the dye bath, or different temperatures. In each case, they tried to test one variable and keep all the others constant. Solutions of cochineal (carmine) dye. To create the different hues of red, tartaric acid was added. The designing, preparation, boiling, and dyeing was done on our second day. It was a Friday before a long weekend, and we discovered an unanticipated variable. Leaving the cloth in the dye baths over the weekend resulted in mold growing in the water and on the cloth. One group testing the walnut shells accidentally dumped out their dye bath, which was a rich, deep brown. They had to start over using the same walnut shells, and the second time the color was much weaker. All of these problems and their effects were noted in the students’ lab notebooks. 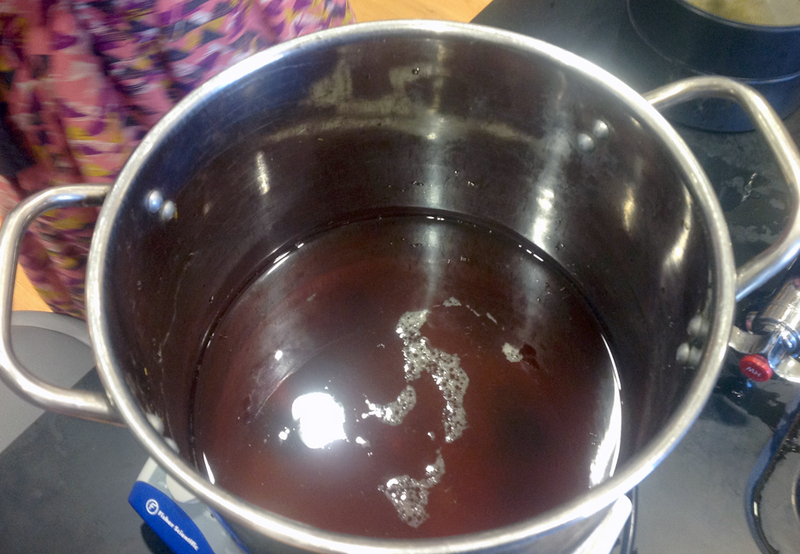 The sunflower (Black-eyed Susan) dye bath turned brown when boiled. It also grew mold over the weekend. 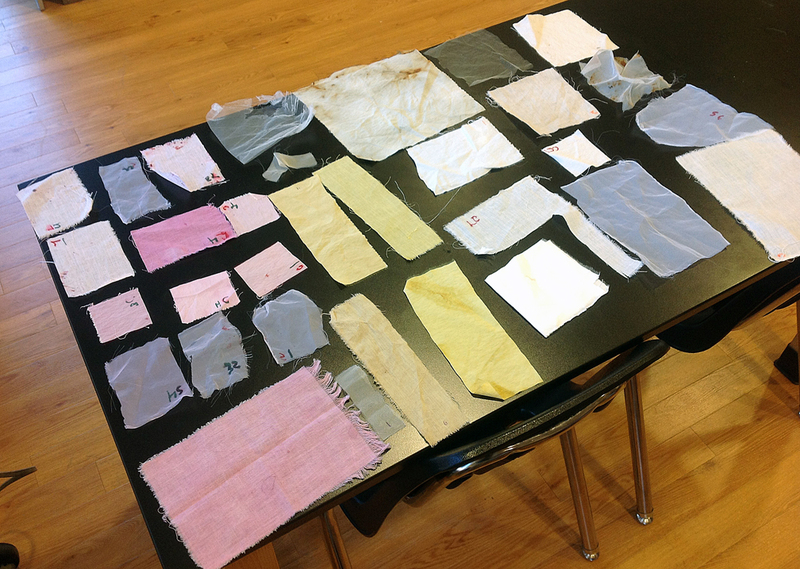 After dyeing, we rinsed and dried the cloth swatches. One team took their swatches home and washed half of them several time in order to test the color fastness. In order to get numeric data that could be analyzed statistically, we compared the color by scanning the dried swatches into a computer and using the Eyedropper tool in Adobe Photoshop to click on three areas of each swatch, then record the RGB values and average them per swatch. The HSB values (Hue, Saturation, and Brightness) were also compared. Finished swatches after dyeing and drying. The pink is cochineal, yellow is rabbitbrush, even tan is walnut, and uneven tan is sunflowers. Undyed cloth is also shown for a control. The students drew their own conclusions based on the variables they were controlling and wrote up the results in their lab books, answering a series of questions I gave them to help them consider what they had done. By the time we finished, we had spent about five days of class time, which was quite an investment but well worth it. We followed up by discussing how dyes are done commercially, other types of natural dyes such as indigo and madder root, and the invention of aniline dyes derived from coal tar such as Sir William Henry Perkin’s discovery of mauve dye in 1856. 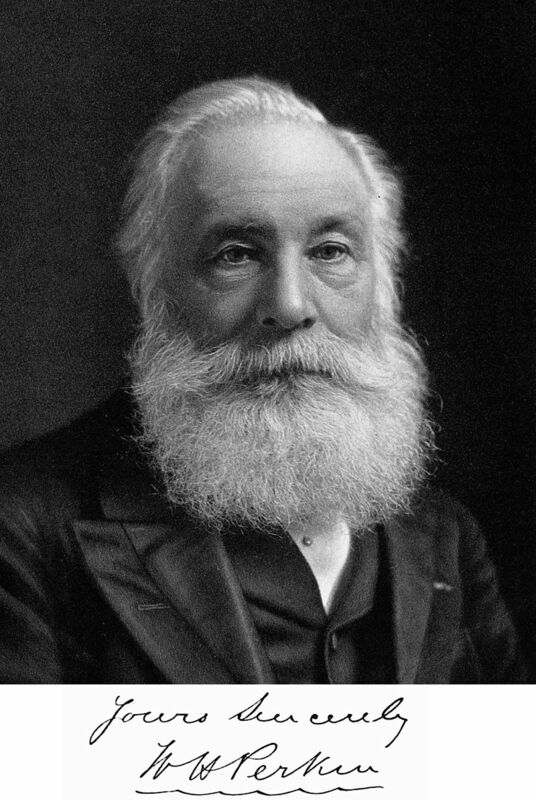 William Henry Perkin, who discovered the first synthetic aniline dye (mauveine) at age 18 in 1856. 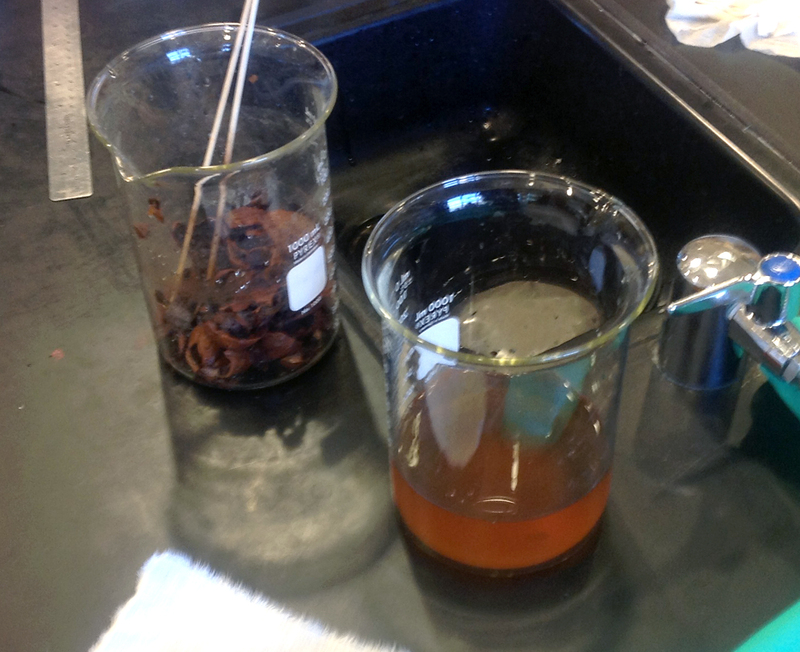 Some notes for improving the lab for next time: I need to make sure we don’t leave the dyes over the weekend, and I want to use wool as a natural fiber in addition to cotton, linen, and silk. I tried looking for undyed and untreated wool, but the hobby stores only carry the mostly synthetic brands that are dyed white. Next time I will have to see if any of my students have access to natural wool yarn, or order it directly. I would like to dye untreated yarn in each color and crochet hats or scarves from it. I don’t want to mess with indigo, as that is quite a process, but I will order some madder root and other natural dyes. 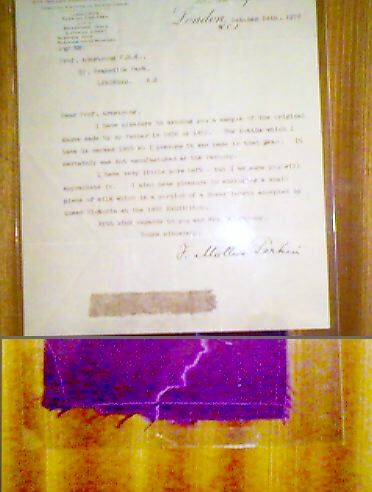 A letter from William Henry Perkin, Jr. and sample of silk cloth dyed with mauveine, the first aniline dye made from coal tar derivatives. It is a much brighter color than we usually associate with mauve today. Finally, I would like to find a way to stabilize the dyes (perhaps by adding vinegar, etc.) so that mold won’t grow, then use the natural dyes for tie-dyed shirts. It would also be fun to make a dye out of purple cabbage juice, soak a cotton shirt in it, then treat it with squirt bottles containing mild acids and bases to change the color of the fabric like a pH strip, then set the colors by heat treating.